This recipe is based on Vietnamese caramel pork belly. I have been cooking this repeatedly for many years and still not tired of it. It's a rewarding recipe with only few ingredients and simple method. The wings are succulent and full of flavour, sweet and salty. Finger licking good. Whenever I cook this, all I need is just plain white rice, nothing else. 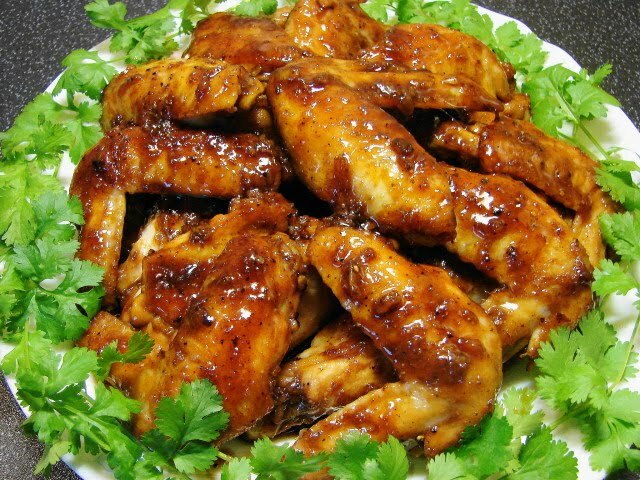 If you like cola wings you will love this recipe. Check wings and remove any feathers. Cut wings into half. Add in garlic, stir fry for about a minute. Remove wings and garlic bits, leave aside. No need to clean the wok/pan, it should be quite clean. Put in the sugar, spread it out a bit. Heat the sugar at medium heat without stirring till sugar beginning to melt, stir lightly, continue heating till sugar has turned reddish brown, like colour of rich black tea. Once the sugar started to caramelise the colour will turn quickly, make sure not to burn it. Then add in a little water at a time, the sugar will boil rapidly. When the sugar stops bubbling add in the wings, stir and add fish sauce. Then add 1 cup of water. High heat cover with lid. When the liquid is rapidly boiling, turn heat down to medium. Continue simmer for about 5 minutes. Then remove the lid. Add in few drops of dark soy. Heat on high to reduce the liquid while stirring. Add in black pepper. The wings will be ready when the liquid has almost all evaporated leaving about few tbsp of sauce and coating the wings nicely. If you find wings very fiddly to eat you can replace them with small chicken drumsticks. Looks fantastic Sunflower! My kinda finger-lickin goodness! Do you think the marinade would work to flavour chicken for the BBQ? If you like to use the same flavour for BBQ. Make a batch of this sauce thickened with some cornflour. Use some to marinate the wings and leave the rest as a glaze when the wings are nearly ready, brush on and caramelise at last minutes. about 1 tbsp cornflour slackened with some water. Make caramel with sugar, dissolve with water. Add remaining ingredients cook till thickened. Add about 1/3cup of this sauce to marinate the wings (800g - 1kg) for few hours. Then use the remaining sauce as a glaze. yes, I've tried the pork version! I'm sure it's even better with chicken wings! Looks so good!